Lionesses of Africa has selected 5 leading women entrepreneurs from Africa to pitch their innovative digital platforms, apps and solutions to big business, government, investors and influencers in Berlin on 26 October, thanks to a partnership between Lionesses of Africa and the German Federal Ministry for Economic Affairs and Energy. For many women entrepreneurs in Africa, getting access to key global markets is a real challenge. There is a need to provide powerful platforms where established and up-and-coming women entrepreneurs on the continent who are developing innovative solutions and products can showcase their businesses to the world’s buyers, influencers and decision-makers. Such a platform is about to happen in Berlin this month, where Lionesses of Africa, in partnership with the Federal Ministry for Economic Affairs and Energy in Germany, will be inviting 5 high impact women entrepreneurs from Africa to pitch their digital solutions at the first 'Startup-Night! Africa'. The call for nominations aimed at identifying five inspirational women entrepreneurs to best represent Africa at this unique event was made at the Lionesses of Africa Annual Conference held last month in Johannesburg, attended by over 300 women entrepreneurs from across the continent. There were some truly innovative digital solutions, apps, platforms and businesses nominated, but eventually 5 were selected to participate and pitch to an audience of around 250 leading German companies, investors, VCs and government officials in Berlin on 26 October. These included: Vere Shaba, founder and Director at Shaba & Ramplin Green Building Solutions in South Africa; Brenda Katwesigye, founder of WaziVision in Uganda; Josephine Marie Godwyll, founder of Young At Heart GH in Ghana; Benji Coetezee, founder and ceo of EmptyTrips in South Africa; and Temie Giwa-Tubosun, founder of LifeBank in Nigeria. The programme for the Startup-Night Africa event, which will be held at the Federal Ministry for Economic Affairs and Energy in Berlin, will be opened by Brigitte Zypries, Federal Minister for Economic Affairs and Energy in Germany. She will provide the official welcome and also give an overview to what the Ministry is doing to support German-African economic development collaboration and partnerships, particularly in the field of digitization and innovation. Melanie Hawken, founder and ceo of Lionesses of Africa, has been invited to give the keynote speech, talking about the growth of women’s entrepreneurship on the African continent and some of the game changing businesses that are emerging. The highlight of the event will be the pitching sessions. The first round will focus on African startup enterprises creating innovative digital solutions for the African and German markets. The second round will be for German startup enterprises that have developed interesting business models for Africa. The third round will see well-established German enterprises willing to collaborate with African startups, including Airbus, Merck, SAP and Siemens. "A key goal is to bring together African entrepreneurs with German startups and German technology. One of the ways in which we are doing this is by hosting a ‘Start-up Night! Africa’." "We've launched this powerful partnership to showcase amazingly talented women in tech from across Africa to German partner companies, collaborators and potential investors ." Read more about the 5 Lionesses of Africa who have been selected to showcase and pitch their businesses and digital solutions at the Start-up Night Africa event in Berlin this month. LifeBank App is an intuitive blood donor database that inspires committed Africans to give blood and save lives in their community. The App helps medical practioners source for the best blood and blood products that patients need. Founded by entrepreneur Temie Giwa—Tubosun, LifeBank is a digital platform that makes blood available when and where it is needed in Nigeria to save lives. LifeBank mobilizes blood donations, takes inventory of all blood available in the country, and delivers blood in the right condition to the point of need. This innovative solution represents the Next Generation of Blood Banking. The LifeBank App is an intuitive blood donor database that inspires committed Africans to give blood and save lives in their community. LifeBank Plus is an enterprise marketplace for hospitals and blood banks. The app helps clients to source for the best blood and blood products that patients need. LifeBank's nimble logistics system helps to deliver the products to patients on time and also provides a simple payment systems that works. An App that can be used remotely by building facilities managers and building owners to monitor, control, report and track green building performance in real time on iOS and Android devices. Vere Shaba is the founder and Director: Green Buildings & Certifications at Shaba & Ramplin Green Building Solutions, South Africa. Vere holds a BScEng (Hons) Mechanical Engineering degree from the University of Cape Town and is a Green Star SA Accredited Professional with the Green Building Council of South Africa, a Green Star Accredited Professional with the Green Building Council of Australia and a LEED Accredited Professional with the United States Green Building Council. Vere has worked for multi-national engineering consulting firms as a mechanical engineer in building services specialising in green building engineering designs which led to her passion and specialist green building experience in office, retail, healthcare, education and hospitality project in South Africa, Kenya, Nigeria, Rwanda and Uganda. In 2013, she was selected as one of SA's Top 100 Women in Business in the "Top Women in Business and Government 10th Edition" publication, featuring as one of the ten Top Women in Engineering. In 2017, she was selected as one of the Inspiring Fifty women in science, technology, engineering and mathematics in South Africa by the Kingdom of Netherlands and as one of Mail & Guardian’s 200 Young South Africans for Environment. Vere is a faculty member and assessor for the Green Building Council of South Africa where, as a mechanical engineer, she facilitates Green Star courses and assesses Green Star submissions for New Buildings, Existing Building Performance and Interiors and is a founder of the Green Building Institute of Africa. The WaziVision App brings quality eye care closer to communities, providing better and more affordable eye care for every school going child between the ages of 6-18 years. Brenda holds a BScTelecommunications Engineering (Hons) from Makerere University, is an ISACA Certified Information Systems Auditory, Information Security and Audit, and has a post graduate qualification from Virginia Commonwealth University in Business and Entrepreneurship. Wazi Vision is a company that provides more affordable eye care in Africa. Incorporated in Uganda, it designs and manufactures custom eye wear from recycled material. It also creates mobile applications that enable testing of eye acuity on a smartphone. Wazi Vision has been recognized and awarded by the United States Africa Development Foundation, the Land of African Business, Citi Foundation and the Vodafone Institute for its innovation and impact. As the founder and Managing Director of the company, Brenda is in charge of the day to day activities of the company; she drives business growth strategy through both product and market development; and provides talent leadership for hiring and retaining the right talent. She is a Board Member on the Regional Advisory Board for the Young African Leaders Initiative, informing the development of Africa-based Mandela Washington Fellowship programming for President Obama's flagship programme YALI. Brenda is also the Co-founder and COO of Ideaspace Group, a company focused on building and implementing innovative technology solutions in finance, healthcare, education and logistics. EmptyTrips is an online trip exchange using smart technology to match and connect spare capacity on a truck, train, plane or ship to those requiring goods transported. Empty Trips, founded by South African entrepreneur, Benji Coetzee, is an innovative online trip exchange using smart technology to match and connect spare capacity on a truck, train, plane or ship to those requiring goods transported! Through her innovation, Benji is revolutionising the logistics industry. Benji has nearly a decade experience in top tier consulting (The Boston Consulting Group), CIB (HSBC Africa) & insurance (Hollard Insurance). Now a full-time entrepreneur. Benji saw the gap in the market, and wants to disrupt a traditional industry whilst enabling growth. She holds a Master of Laws (LLM) in Finance, Institute of Law & Finance from the Goethe University in Germany, a Masters in Philosophy (MPhil) in Maritime Economics and a BCom in Finance from Stellenbosch University. Ananse the Teacher App harnesses local folklore to engage Ghanaian children in science, technology, engineering, arts and mathematics. Josephine has developed a Digital e-learning platform driving computer literacy for rural and deprived communities in Ghana; and the Ananse the Teacher App to help young children to learn through animation. Josephine Marie is a young enthusiastic engineer and a passionate Social Entrepreneur. She is a Mandela Washington Fellow and in 2016 won the Tigo Digital Changenakers Competition globally. 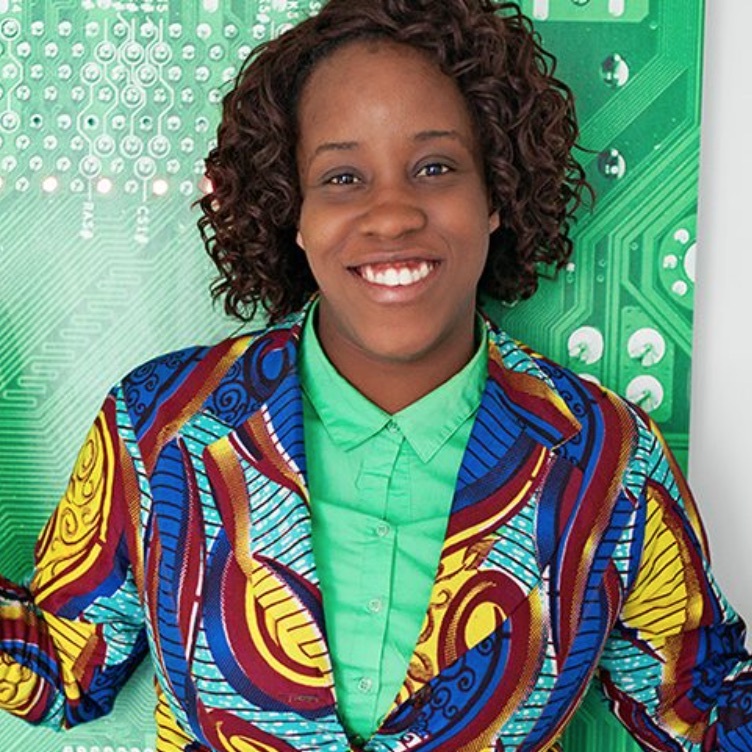 She believes in the prospects of the Future generation of Africans who can turn Africa into a Hub of I.T Technologies. Encouraged by this belief, she isthe proud Founder and National Coordinator of Young at Heart Gh an organization that is championing a Revolution of effective Computer Literacy for Children in Africa. She has lead her team to reach over 2500 children in rural and deprived communities with no practical exposure to computers, empowering them with basic skills in I.T. She has recently created an e-learning platform called "Ananse the Teacher" which would allow children in Ghana to study GES syllabus based content on Maths, Science and English using digital platforms like mobile phones, tablets and computers. After years of volunteering to teach in basic schools in rural Ghana, she noticed that most kids were not able to properly relate with the learning material that was often used in teaching them. Thus, she wanted children to have local examples that they could easily understand and relate to. Ananse, a local popular character in Ghanaian folklore has been integrated into the app as a teacher. This coupled with his stories and experiments allows children to engage, relate and participate in educational activities in a manner which they are very conversant with. Thus, educating children in Ghana while instilling in them a sense of cultural identity. Link to App. Visit Website.